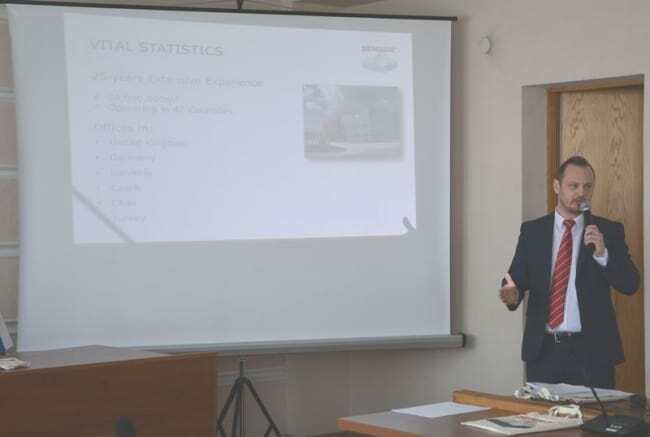 An Executive Manager Slavo Spes, MSc held seminar at the Ministry of Regional Development and Construction with reference to Sensor’s experience in solid waste management and implementing of geomembrane leak detection solutions into the landfills in Moldova. The event was attended by representatives of the Regional Development Agencies, State Construction Inspection, designers, architects etc. The seminar also attended Moldavian Deputy Minister of Ministry of Regional Development Mr. Ion Stratulat and also Head of Slovak Embassy in Moldava Ambassador Robert Kirnag. Participants showed great interest in modern technologies in the construction of landfills in Moldovan republic.